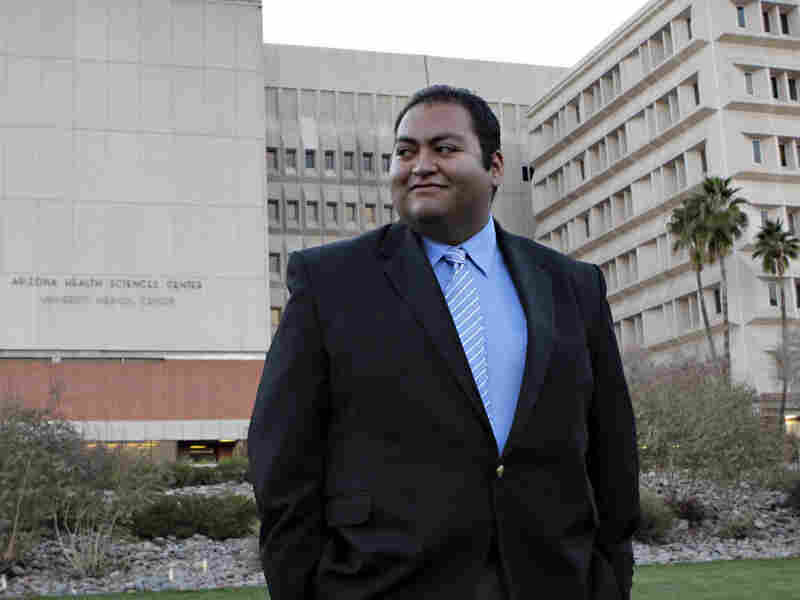 Intern: 'I Ran Toward The Congresswoman' Daniel Hernandez is a junior at the University of Arizona. Last Saturday was his fifth day as an intern in Rep. Gabrielle Giffords' district office. Hernandez raced to her side after she was shot, stanched the bleeding and stayed with Giffords through her ambulance ride to the hospital. Six people were killed and at least a dozen wounded, including Arizona Rep. Gabrielle Giffords. Daniel Hernandez walks across the lawn outside University Hospital in Tucson on Sunday. Prior to his current internship he worked on Rep. Gabrielle Giffords' 2008 campaign. Daniel Hernandez, 20, is a junior at the University of Arizona with limited training in first aid and triage. Saturday was his fifth day as an intern in Rep. Gabrielle Giffords' office. I came in at about 9:15 and I was assigned to help staff this event as an intern. I helped set up. At about 10 a.m. the event started. A few minutes later we heard gunshots. I then ran toward the congresswoman and those who I assumed would likely be injured. The first thing I started to do was to try and check for pulses as well as to see who was still breathing. I got to do that for two or three people before I actually realized that the congresswoman had been one of the people who had been hit. When I realized that congresswoman Gabrielle Giffords had been hit, she became my top priority because she had not only been hit with a bullet but she had also been hit in the head. I didn't notice any other injuries but I did notice that the position in which she was in was one where there was some danger of possible asphyxiation from the blood loss. So the first thing I did was to pick her up and prop her up against my chest to make sure that she could breathe properly. Once I was sure that she was able to breathe properly and wouldn't asphyxiate, the next thing I did was to apply pressure to her wound to make sure that we could stem the blood loss. He did, and she survived.